TurboTax Deluxe (which happens to be on sale right now) is the most popular version of Intuit’s tax preparation software. It encompasses tax categories used by most taxpayers and is most appropriate for individuals who receive W2, own real estate and/or freelancers who receive miscellaneous income (1099-MISC) and claim simple expenses. Despite some criticism from users that this version no longer supports Schedule C (Profit or Loss from Business), Schedule D (Capital Gains) or Schedule E (Supplemental Income and Loss) it still earns excellent marks for the quality and accuracy it offers. The software is updated with the latest tax laws and regulations and guarantees exact calculations of your return as well as the maximum refund based on over 350 tax deductions it analyzes. In case the IRS questions correctness of the presented information, TurboTax stands 100% behind its calculations and offers audit support. One of the advantages of preparing taxes at home or being a repeated customer is automation. Whether it’s importing W-2 for the first time or using the software again, automation saves lots of time as it populates required fields and transfers data into appropriate forms. You still have to verify that the information imported by the software is correct, but the action can be appreciated especially if your tax return requires multiple forms. You can even enter W2 data by taking a picture of the form using a smart phone and a mobile app (see the link to the app within the software). Additionally the app allows for working on your taxes from your phone, tablet or computer. The information you enter it updated between all devices to better match your preferences or lifestyle. One of the new features of TurboTax is an extension to Benefits Assist. While filing taxes the software can check whether or not you qualify for any of the government benefits unrelated to taxes. Since you already provide all required information it can’t hurt to see if you can get some additional support from the government. TurboTax will check for your eligibility for food stamps, Medicaid, low cost phone line or discounted utility bills, or auto insurance. Another added benefit of TurboTax, although it will appear in most tax software, is the section of the Affordable Care Act or ACA. It will come especially handy this year, as it is the first time questions about health insurance appear on tax returns. With hundreds of potential scenarios it will be of great use to have some help as we all are just beginning to grasp all intricacies of these requirement. With the portion of the return dedicated solely to ACA and answering questions about life situations, TurboTax Deluxe will assist in filling all the correct forms and evaluate options to avoid penalties for uninsured taxpayers. Not much has changed here since last year. Intuit has developed very used friendly format of going through different areas of tax preparation, going between forms, updating information, and understanding tax vocabulary. It explains what the terms and answers mean and how they affect your taxes. It also provides recommendations for the upcoming year to lower your tax bill. Naturally, they are not always applicable but help better understand your options should your tax situation alter due to life changes. The product has been widely accepted by the users. There are over 40,000 reviews on its website giving it nearly perfect score 5 out of 5 stars. One common comment about the product is that is easy to use. The users also expressed that they were able to learn and understand taxes while preparing the returns. TurboTax is also top rated product on TopTenReviews.com obtaining a perfect score. The reviewers seem to agree with the product users on its simplicity and accuracy. Although certain fees to file state taxes may be higher than those of other products, it is an established and trusted product that keeps up with any tax changes and situations. TopTenReviews awarded TurboTax 2015 Gold Award and 2015 Excellence Award. Reviews.com gave it 5 out of 5 stars for uncomplicated design and plethora of learning resources. Which tax forms does TurboTax Deluxe supports? 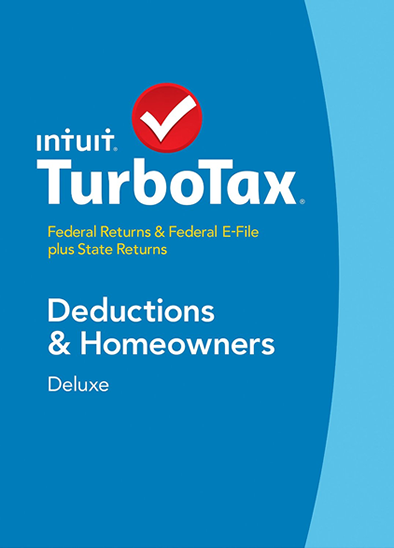 Be sure to see our full list of tax forms that are supported by TurboTax Deluxe.